When I arrived at Dallas Fort Worth airport, Steve and Rustin, who came to visited me in my hometown back in June, were waiting. It was great to meet them again! Probably none of us thought we would meet in Texas again this way... they were actually the part of my blindness mobility training. Without their encouragement and support, I would never be in the United States for it! From Chicago to Dallas Fort Worth on United Airlines. 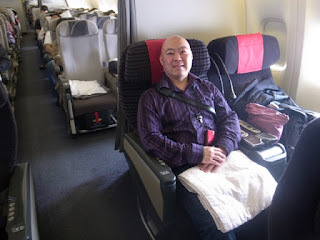 Though I am not a United Mileage pPlus status holder, I was put in the first row of Economy Plus seat. When the beverage service begun, a flight attendant took my order and put a can of Coke Zero and a cup with some ice on a table and took off. Unlike ANA, they do not pour some drink in a cup for me? Welcome to America! A bit later, she came around and asked how I was doing, and I told her I was trying my best. First, I thought they are a bit mean, but later I thought they are letting me do it intentionally... values my own will. After a while, I talked with the flight attendant for a while, explaining I came to America to get blindness rehabilitation training. She wished me a luck, and she handed me a cookie for me! I was touched by the American way of kindness by a flight attendant. As I arrived at Chicago, a friend of mine who I met on the internet took me out for the Chicago pizza experience. Art took me to a place called Ginos Feast and we ordered a pizza. What I like about ANA is its Japanese hospitality. While JAL stopped offering similar services, I am impressed that they wake up passengers with a piece of warm cotton cloth to wipe hands and a cup of orange juice. The breakfast is rather huge for economy class! Some pancakes and sausages with yogurt. Cannot go wrong with ANA! 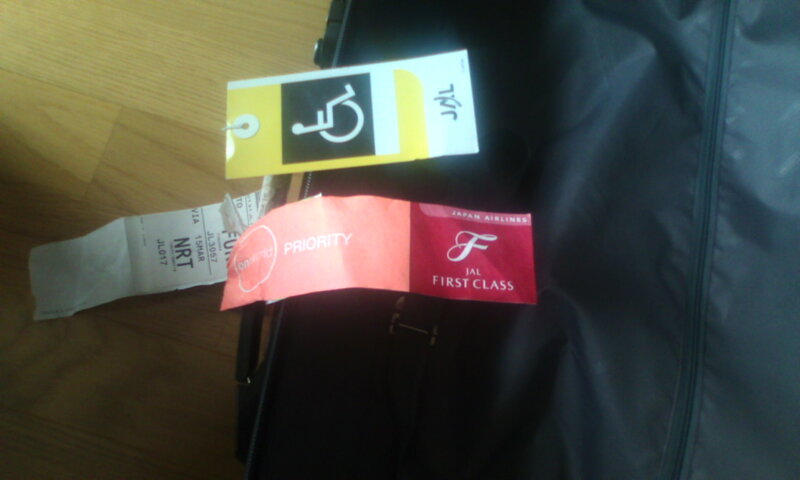 At check-in, I asked for an upgrade, and I got Premium Economy Class upgrade. The premium Economy cabin is located before Economy class cabin, and it offers more legroom and width, and with a seat that comes with footrest, regrest and the back reclines a little more than economy class. Though I got a one-class upgrade, my meal is upgraded to business class! Did not know what it was, but it tasted great in my mouth! I only had an hour to make a connection at Tokyo Narita airport for the flight to Chicago, so a helper was waiting outside the aircraft with a wheelchair. It seems that I got the top priority to go through the security check and immigration, but by the time I was in the area, I my guide and I heard the call for priority boarding for my flight to Chicago, he pushed me with chair to get me on the airplane!. After my flight took off, I was served with some otsumami snacks and some drink. I was surprised by that because JAL stopped offering it! Leaving Fukuoka Airport for the perceptual mobility training in the United States in America! Daniel told me that a long cane is waiting for me. Daniel is known as a tongue click echolocation guy, but before that, he is the one and only certified mobility coach as a completely blind man in the United States. He once asked me that he bets I use a short cane that comes to the chest height. He insists we the blind should use long canes for maximizing the perceptual mobility. Does He means, his perceptual mobility training consists of echolocation and long cane technique? In his essay, he mentioned that using a cane is the part of perceptual tools, along echolocation that includes tongue-clicking active sonar and passive sonar, to understand what's around. From his experience, a longer cane generally helps people of all ages to gain mobility. For children, he found out the cane of their height will give confidence in walking around. When they walk with parents, or adults, they tend to have shorter steps and try to catch up with the speed of adults, so a long cane provide information of further ahead. For adults, longer canes generally give confidence, no longer need to bend over the back to find out the objects on the surface. Back is straightened and walk with more confidence! I indeed find my cane is too short: When I tried to find a wall on the side, I had to extend my arm so I am often bend my body to forward. I always wished I wanted a long cane, so this will be a great chance to acquire it! By the way, a long cane will be heavier, bulkier and it may increase a chance to collide with other people, but Daniel says we will get used to it. I might cover about the issue of cane length after I talk with Daniel about it in person. After I made a deal with Daniel about his team at World Access for the Blind offering the blindness rehabilitation program, including tongue clicking perceptual mobility training, Daniel started planning the series of training and activities. In the 2nd week, Daniel says he makes sure he will put me on a bicycle, take me to the beach, let me play some ball games, taking me to a hike, and teach me how to cook, so I can ride a bicycle, walk in a terrain, and cook Daniel a meal! ... can I really do it? Never know until I try them out! I also learned that Daniel will be in and out from his house, so Juan Ruiz, his former trainee who is now teaching flash sonar under Daniel, will spend some time with me when Daniel is absent. The departure date is getting nearby... in 2 days! My friend visited me and we had a good time. This is my attempt of blind portrait photography, applying all knowledge and technique I have at this moment. I set the aperture to the maximum number. Ayane claps her hands right in front of her face. I just point my camera at the clapping sound, then clicked the shutter. It is sort of echolocation applied to portrait photography, isn't it? I did not know what I got until my friend told me what this car is. It seems I am following the sound of motor just fine... it IS echolocation applied to blind photography, right? What he calls 'passive sonar' is the sound produced by someone or something else. Though this kind of sounds give general feedback on what is happening around us, but it does not give precise feedback on things around us, like the distance, size and the type of material. Whereas, what he calls 'active sonar' is the effective way to find out what is ahead, as you control the sound by producing it by yourself and hear the echo. But what if we are in noisy environment? - He answers in his literature that we should be able to determine our own tongue click from others since we control the click sound... in flash sonar, he recommends we practice distinguishing our own tongue click sound from others by clicking to the wall and hear the sound, which he calls the process 'hook stimulus' so we will get to hear our own click sound regardless of the environment. His term of 'active sonar' seem to include other sounds made by ourselves, like a tapping cane sound or a clap of hand. Though cane tapping and hand clapping may help us understand what is around, Daniel says it does not give us feedback for determining the distance, the size, and the material of the object. Moreover, cane tapping sound is made too far from our ears, so as hand clapping. if clapping hands right in front of face, we won:t hear the echo. Therefore, Daniel believes his 'flash sonar' with hearing the echo of our own tongue click works better than other audio feedbacks available around us. Though he did not say this, I think he uses his flash sonar technique when passive sonar does not give enough information, and I would like to confirm that by meeting him in person... soon! Yes, indeed, when he describes his tongue-click being used for echolocation, he says that the tongue click sound is like a camera flash - flash it and bounce off from the objects. By hearing the bounced sound, he draws the image of the scene on his mind. Okay, it does sound like how flash works in photography term. If the tongue click sound is sharper and travel further, or if flash is stronger and the light reaches further, the audible or visual information bounce back, though it may only give a small information if the subject is far away, but if the receiver picks up the valuable audible information, or the film or image sensor in a camera is capable of receiving tiniest lights, the scene can be captured and processed as a visual image. It is like I tried to shoot with passive lights whenever I can, and I rarely used active lights to shoot, like studio photography. In echolocation term, I have tried to live with passive sounds that are produced by others, and not actively produce my own sounds to try to find out what is around. Surprisingly, they gave me a go for this! Then I grabbed my cell phone and accessed to ANA Sky Mobile website, looked up for my flight. Of all choices or routes, I chose this one. I had a choice of the entry point of the United States, and I chose Chicago over San Francisco and Los Angels because I wanted to arrive Dallas before dusk: I would arrive Dallas / Fort Worth later in the evening if I make a connection in West Coast cities. After booking my flight, ai called ANA Sky Assist desk that handles any special needs for handicapped people, and I gave them my ANA mileage club frequent flyer number, and they dispatched the frontmost seats and a wheelchair at each airport. How efficient! I told Daniel this is the Japanese hospitality,the reply from him was not what I would expect... He would not take a sheelchair, and if he or she insists, I just walk away! Whoa... The airlines in Japan and the airport staff think making a blind person walk might bother, and interfere with other passengers, they tend to put him in a wheelchair, so it is easy for the blind and for the ground staff. But Daniel thinks it different. Oh well, both ANA and United airlines have my past medical records and special assistance orders, they will insist I take their wheelchair offer! aFTER MEETING WITH sTEVE, i NOW HAVE AN ANOTHER DESIRE... VISIT HIM IN tEXAS! ... AND i THOUGHT, WHY DON'T i VISIT HIM AT THE SAME TIME i GO TO cALIFORNIA FOR THE PERCEPTUAL MOBILITY TRAINING BY dANIEL? aS i THOUGHT ABOUT THIS, i WAS SITTING ON A COMPUTER, SEARCHING FOR A FLIGHT TO FULFIL MY DESIRES ALL AT ONCE! dESPITE MY TIME AND EFFORT, IT ONLY ALLOWED ME TO SEARCH FOR A SIMPLE ROUND-TRIP FLIGHT! i TRIED TO LOOK FOR ANY 2-STOP OPTIONS, BUT i COULD NOT FIND THAT OPTION. i GAVE UP ON jal WEBSITE FOR pc, i PULLED OUT THE MOBILE PHONE AND SEARCHED FOR A FLIGHT, BUT ALAS, IT IS EVEN WORSE! iT ONLY ALLOWED ME TO SEARCH FLIGHTS ORIGINATING tOKYO AND NOT ALLOWING ME TO SEARCH FLIGHTS FROM fUKUOKA WHERE i LIVE! tHE SEARCH PAGE LET ME SELECT fUKUOKA AS ORIGINATING AIRPORT, BUT IF i SEARCH FOR A FLIGHT, THE SITE RETURNS AN ERROR PAGE SAYING THERE ARE NO FLIGHTS FOUND. aNYWAY, i GAVE UP ON jal AND i ACCESSED TO aLL nIPPON aIRWAYS (ana) WEBSITE ON pc. a HALF YEAR AGO, ana WEBSITE MADE ME NUTS WITH SCREEN READER... TOO MUCH UNWANTED INFORMATION. bUT, WHEN i ACCESSED TO THE WEBSITE, i IMMEDIATELY NOTICED THE CHANGE... IT IS MUCH NICER AND MORE ACCESSIBLE FOR SCREEN READER USERS! bEFORE, ALL TABS AND LINKS BURIED UNDER PICTURES WERE JUST READ 'LINK' BUT THIS TIME, IT READ LIKE 'dOMESTIC'AND 'iNTERNATIONAL' BY SCREEN READER, i CAN FOLLOW THE LINKS AND GET THINGS DONE! i ACCESSED TO THE INTERNATIONAL FLIGHT SEARCH PAGE AND FOUND A BUTTON LINK THAT READS OUT 'TWO-STOP FLIGHT SEARCH, NO TRAVEL BY LAND TRANSPORTATION' SO i JUST PROCEEDED. aFTER ENTERING fuk-nrt-dfw-lax-nrt-fuk, IT RETURNED THE FEW RESULTS THAT CONSISTS ON FLIGHTS BY ana, uNITED, cONTINENTAL AND us aIRWAYS! oN ana MOBILE WEBSITE, i COULD DO THE SAME THING. iT SEEMS THE SYSTEM IS CONNECTED, i CAN MAKE CHANGES ON MOBILE PHONE AND THE CHANGED INFORMATION IS APPLIED ON pc WEBSITE. i EVEN CALLED ana TICKETING OFFICE TO CHANGE THE CODESHARE FLIGHT FROM us aIRWAYS TO uNITED BY PHONE, IT IMMEDIATELY SHOWED ON MOBILE SITE. oKAY, i WILL GO FOR ana THIS TIME! bY THE WAY, i ALSO TRIED aIR cANADA, BUT i COULD NOT PROCEED THE FIRST PAGE THAT FORCED ME TO CLICK TO CHOOSE WHETHER i WANT TO ACCESS IN eNGLISH OR fRENCH. mY SCREEN READER DID NOT READ THE LANGUAGE SELECTIONS. aLSO, i ACCESSED TO uNITED / cONTINENTAL aIRLINES HOMEPAGE, AND FOUND OUT i CAN SEARCH FOR A FLIGHT IF i KNOW THE AIRPORT CODE (MY SCREEN READER DID NOT READ PULLDOWN / POPUP MENU) BUT WHEN IT COMES TO THE FLIGHT SELECTION WINDOW, THE ORDER SCREEN READER DID NOT MATCH THE RADIO BUTTON TO SELECT THE CORRECT BUTTON. It was the early August, 6 weeks after Steve and friends visited me in my hometown, they were going back to Texas. As I heard about it, I went to Fukuoka airport to see them off. Though, again, we did not have much time to talk, I told him I am planning to fly to America to get some blindness rehabilitation training. Texas became the second destination! Speaking of blind photography, I can only shoot something that make noise... All I do is set the aperture and shutter speed and follow the noise! Therefore, I started shooting with moving vehicle! 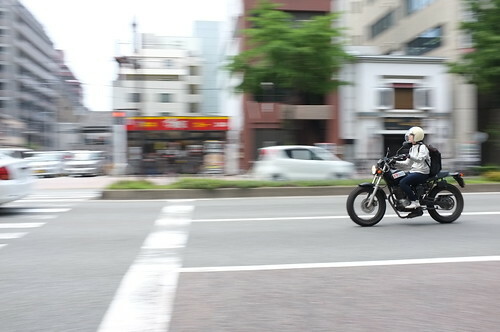 Panning shot is fairly easy for blind photographers, as the only thing to do is follow the sound of motor. Though it is easy to take a still photo with auto setting or at fast shutter speed, it will not show the speed, so I set the shutter speed to 1/60, and the depth of field set to the deepest for showing the fast movement. Please click the photo below to see more information about the photo, including EXIF data. For the first time after becoming blind, I attended a party, and it happened to be a Canada Day party! ... but how a blind man can socialize? As I thought, almost everyone is busy with themselves, I met Mirei and Joe, a nice couple at the table I was standing. They told me they lived in Whistler for over a decade, and we had a pleasant chat about Canada! Since no one sponsors me for Daniel's perceptual mobility training, or tongue clicking echolocation training, I started talking with Daniel for the conditions of possible individual training. He said in his email that a few hundred a day would not hurt our feelings, so I told him I live on a disability pension that barely pays for housing and food. I also cannot afford a hotel during my stay in California. After all, Daniel agreed to offer the training for two weeks for the minimal cost, and he will let me stay at his home as long as I want... But of course I can't stay there for the rest of my life, I asked him to let me stay until he gets very busy. Then, I proceeded to the most difficult task... to convince my parents for letting me go! After few email exchanges with Daniel, I asked one thing. - Whats the ideal tongue click? He said, not too loud, but not too quiet. Then, he sent me a bunch of reading about tongue click reproduction readings. Basically, the tongue click sound can be substituted to the radio noise, the off-tune noise that has high pitch sound. If making tongue click, press the middle of tongue firmly at the top part of the mouth inside, and quickly move the tongue downwards, but make sure the tongue not to touch anywhere inside the mouth. It should create a cluck click instead of a melodious sloppy sound. When doing all of this, only the tongue is tensed, and jaw must be relaxed. He suggests to hold a jaw while practising clicking tongue. After all, I asked there are any tips for easy popping sound of tongue click, and he said, I should smile contentedly while clicking - the More you smile, the sharper and brighter clicks will be! In an email reply from Daniel, he kindly answered the four questions I asked. Q1. Has anyone from Japan contacted you about echolocation? A1. A very few. One Japanese American who wants to spread echolocation in Japan but disappeared. He was interviewed by two different TV crews for Japanese TV shows, and recently he was interviewed by an another TV crew for a show that will soon to be aired in Japan. Besides, he has not heard from any Japanese. Therefore, I am the first Japanese, besides TV crew, to get in touch with him, asking about echolocation. Q2. Are you planning to come to Japan to teach echolocation anytime soon? A2. Never been to Japan and no plans to visit Japan yet. If there is a sponsor, he will come to Japan and teach. Q3. Is it too late for a man of mid-30s to start learning echolocation? A3. Absolutely not, he says. Q4. If I come to California, would you teach me echolocation? After all, I learned that I seem to be the first blind guy in Japan who takes echolocation seriously, even though the TV shows featured echolocation aired twice in Japan, it did not draw too much attention. Within few hours from me sending the first email to Daniel Kish, the president of World Access for the Blind, I heard back from him with a lengthy mail, starting with appreciation of writing him. Secondly, he described my English 'beautiful' as most native speaker of English would not write as good. I am totally flattered, but I also thought he is just being polite. But, I soon find it is such a professional and thoughtful mail! As the first and only certified blindness mobility coach in the United States of America, he started off with the length of my cane. He wrote I am using a rather short cane that comes to the chest-level, and he is totally right about it - I use a chest-height cane. I mentioned in my email to him that I have trouble walking in rural, mountainous area, and he suggested I should consider replacing my cane to a longer one, like the one that comes to my chin or nose. He gave me a few links to websites that support the idea of cane length. Followed by the cane length consideration, he gave me a reading that contains the story of his first day at Kindergarten, using tongue clicks to find his desk in a room. It is such a adventure! From the reading, I learned he does not click his tongue madly - just click when he needs audible feedback! An another story he shared was a diary of a mother whose son became blind. After learning echolocation technique, he became active! After all, his response to my concern about staying home, will turn around if I adopt a long cane and learn to click -- to become active! Encouraged by my American friends, I took one step forward towards echolocation... sending email directly to the president of World Access for the Blind, Daniel Kish. Having no idea whether he will read it, even though the email address contains his name, Daniel Kish, I started composing a message. Just in case he has a secretary or other helper to read it, I chose words carefully not to be rude. The message start with describing how I learned about him, my interests in echolocation and flash sonar technique, followed by my current situation as I am overprotected and always stay inside, wishing to go outside, and earn some freedom by learning echolocation. The message concluded with the 4 questions for him; any Japanese people contacted him before, he will come to Japan sometime in future, too late for a man in mid 30s to start learning echolocation and flash sonar, and whether he is willing to teach me if opportunity allows. It took awful 4 hours to write one email, since I am Japanese and English is not my native language, but I am satisfied with what I got in the email message. I safely returned from my two-week Canada trip from Vancouver, and returned to the normal routine. The twice-a-week blindness rehabilitation training and occasional check-ups on my eyes and heart. From May, I proposed to my mobility coach that I want to learn to walk down the street in Fukuoka Tenjin area, and be confident with dropping by a coffee shop and take a break! My mobility coach is replaced, and he has done a tremendous work on me: By July, I learned to go to McDonalds and order some lunch, and learned to go to cafe veloce for some coffee. Moreover, I learned to take public transportations like Nishitetsu bus and train, and I no longer be hesitent to go to DOUTOR coffee shop at Nishitetsu Fukuoka Tenjin station. If I have specific goal, like food, I tend to learn faster! While I was in Canada, I wanted to visit Victoria, so I asked to my best friend to come along with me, since I am blind and I had no courage to go to Victoria by myself. To Victoria, we must cross the ocean. 25 minutes by airplane of about 1 1/2 hour ferry ride. I decided to take the easiest and second cheapest way: Take a Pacific Coach Line - the bus goes into ferry and cross the water. When my friend and I came to the bus depot in Vancouver, the lady at ticketing office gave me a complimentary ticket! I did not know that the second person is free if traveling with a person with disability! While I stayed in Vancouver in March 2011 for a couple of weeks, I got acquainted with a visually impaired friend, and he offered to take me back to the apartment I was staying. He was familiar with downtown Vancouver. Moreover, he had an android phone with compass and google map that reads out streets and intersections for him, we thought we would have no problem. However, when we get nearby, we have no idea which is the right building! Since I am totally blind and he is visually impaired, and he cannot see anything as it gets dark outside, and his Android phone claims we are at the right place, we try to grab someone for help. Vancouver is fairly safe and friendly place, but after sun is down, people on the street suddenly turn into an ignorant or a snob, not willing to stop for us. After several tries, finally there is a person who told us that the building is across the street! Okay, Google maps and talking compass sort of works, but it does not tell exact building. This technology may work for sighted people, but the Android phone definitely needs brush-ups to become a superior companion for visually impaired and blind people. 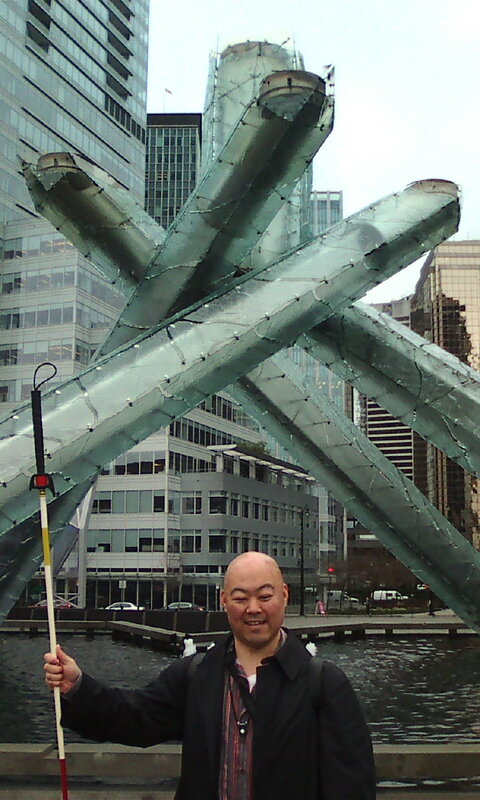 When the 2010 Winter Olympic Games were held in Vancouver, Canada, I was in the hospital, unable to watch the games. 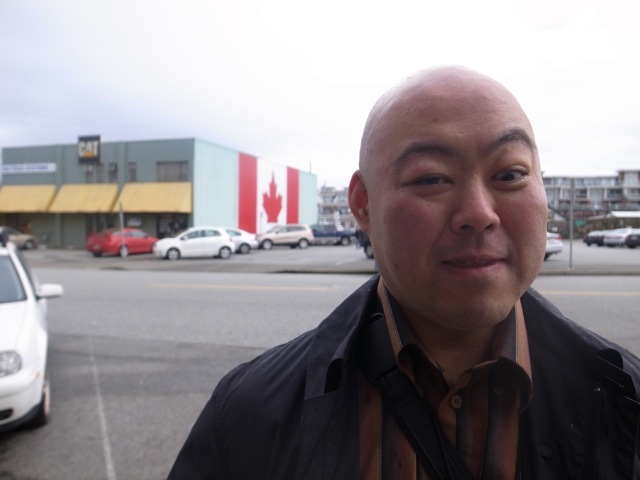 One year later, I was in Vancouver with no eyesight. The weirdest Japanese food I heard while I was in Vancouver, is Japadog. My friends took me to the Japadog restaurant situated near the Vancouver Public Library on Robson St. It:s basically a hot dog with some ingrediences of Japanese food. I ordered so-called Tonkotsu Dog, and I ended up getting some deep-fried pork on a hot dog bun. so, I, along two other friends of mine, ordered something that none of other customers ever order... Age Ice Dog! When the cook in the kitchen heard the order, my friends told me their faces uplifted with smiled, and start sprincling some sugar on a hotdog bun and dumping in a deep flyer! The Age Ice turned to be a hot dog with ice topping on a deep fried bun with sprincled sugar - A dessert hot dog! I cannot see it, but it represent it very well. It was happened unexpectedly. As a blind who needs some assistance, I got a priority boarding. The automatic gate did not stop me, and I was seated in an economy class seat. As more people get aboard, a flight attendant whispered me that they wish me a comfortable flight, and guided me to the business class cabin! Later, I asked the chief attendant what made her place me in a near-empty business class cabin, and she said I were a JGC! After all, the flight was much more comfortable that what it would be in economy class seating... but alas, the food was the same as economy. For the second meal, all I got was a piece of sandwich and a pickle! In my first flight with JAL since I became blind, there was nothing to complain about the domestic flight from Fukuoka to Tokyo Narita. In other words, there was noting superior, but not disappointing. The flight attendants were nice and efficient, making sure I know the attendant call button. At Tokyo Narita airport, a sighted guide greeted me outside the aircraft, offered to take my backpack for me, helped me getting on a tarmac, lead me to the bus to the terminal. On the way to the departure gate, he stopped by McDonalds for a quick lunch followed by currency exchange booth. He helped me getting through the security and immigration (I went through the priority / crew line, it seems!) to the gate. His work as my guide is over after taking this shot. 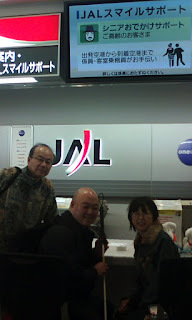 I asked whether he is a JAL staff or Narita Airport Authority, he told me that he is the part of JAlL group company. JAL has a subsidiary company for handling handicapped and disabled. 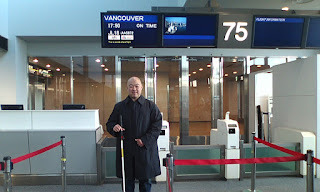 While I was concerning when I should contact with World Access for the Blind, I was invited to go and visit my friends in Canada IF I CAN, so I took a chance to fly to Vancouver... alone! Though my parents were strongly against it, I convinced them that everything from airport pick-up and drop-off, and someone will be attended with me all the time (which were not realistic), I finally convinced them to let me go! My choice of the airline for this trip was Japan Airlines because I was not sure how travelling blind alone would going to be, I would be peace of mind if I have less stress communicating with flight attendants in Japanese... but frustration stroke me at the time I try to book online... JAL website is not fully compatible with screen reader so I cannot book my flight! Moreover, I tried to book it with my mobile phone, it only show direct flights from Japan to international destinations and shows no flights connecting flights! Therefore, I ended up calling the ticketing office and booked my flight. Then, I called JAL Priority Guest Service to let them know I am blind, and it is all done! When I arrive at Fukuoka airport, the representive guided me to a counter for people who needs care - JAL Smile Support, instead of lining up at the regular counters. They even offered to take this photo! 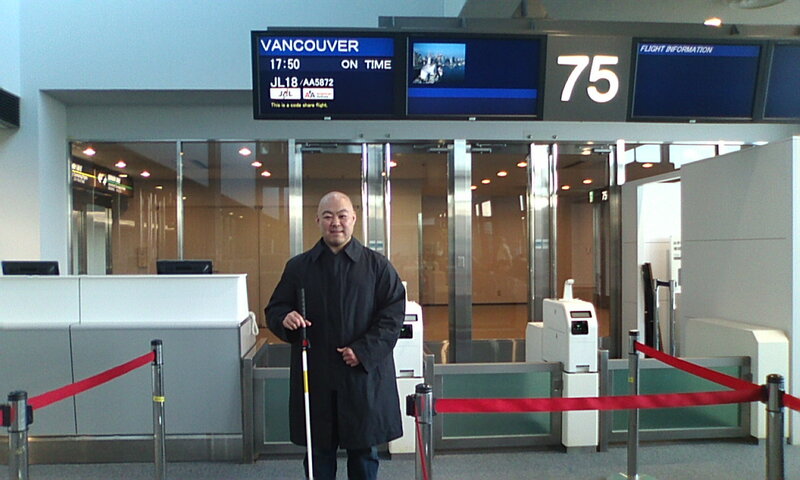 Except for awkward booking process, the support provided for the blind by Japan Airlines is satisfactory. from the movie, I heard the name of the person but did not know how to spell it. Searching with word like echolocation give numerous results. Moreover, searching in Japanese gave me totally off-topic results! Meanwhile, some friends on facebook looked up for any information about him, and my friend sent me a this. This lead me to the president of the World Access for the Blind, Daniel Kish, and we are getting into a talk... me as the first prospective Japanese student and a serious learner. I had absolutely no idea until one of them sent me a link of a movie clip on YouTube. I cannot figure out how to grab an embedded link for this movie clip, so I just posted the direct link to the YouTube movie link page. When I heard (watched) it, I was stunned! I just could not helping whether other blind people in Japan know him, I asked the other blinds wherever I go... but no one takes it seriously, saying it:s so unreal, all we need is a sighted guide or family who take care of us. 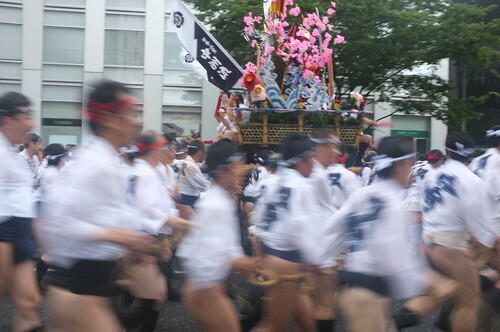 Japanese people value harmony, rather than individuality and responsibility of self. This was the day of my journey to seek for freedom and independence for my　future, by exploring about echolocation and flash sonar - later found out I became the first Japanese man to be taught the skill in future! It was a year and a half ago, I left the hospital and spent doing nothing for a few months. I lived and still do live with my parents in a rural mountainous area despite my desire of living alone in more convenient city. When my parents go out, they lock the doors and windows. When they drop by a shopping mall on the way home from my doctors appoinments, they lock me intoa car. I am overprotected, after all. I want freedom and responsibility because I cannot live like that for good. I am not sure this is the typical menu of blindness rehabilitation training in Japan, but I do get the following training. Starting with walking inside, finding a washroom and navigate through the floor and rooms with sliding hands on rails or wall. After getting comfortable with indoor walking, I practised whacking a cane. Though I briefly told I can slide the cane to find the surface, tapping the cane was soon to be introduced. Since then, I go out on the street and started walking with a cane. More about walking training and blindness mobility training follows. It was totally new to me, as I never thought about the existence of braille until I completely lost my sight. Though most adults usually learn to write braille before reading, I was trained to read it first before writing it. The reason for it that adults fingers are not as sensitive as children so it is easier to learn to write first, but I went against that theory... after all, I just can read it slowly, not that fast. I first learned Japanese braille characters, followed by numbers then alphabets. It has been just a year since I started learning braille, but I at least read it at slow speed but can write it at fair speed using brailler (typewriter) nowadays. The most delightful skill I learned is use of PC with screen reader )software that reads things on screen) again, even after becoming blind! Started with turning it on and off, learned to blind touch (touch typing) then learned to navigate through menus. Also finding out which software works with screen reader and which do not. Since then, I learned to surf on the net, sending and receiving email, checking news, accessing to libraries and read books, and now I figured out to blog! If I want to, I can learn to use Word and Excel, but since they are not my priority, I just put them aside. I wish I could attend other classes like cooking, but two-hour travel to the facility from home prevents me from attending there every day. Back to February 2010, I lost most of my sight, and worried about my future. How do I live from then? I was in the university hospital and social worker had no idea where I can go after getting out from the hospital. At the municipal welfare and healthcare department, no one had any idea so they recommended that I go in a care home with other eldery people. WTF!? After leaving the university hospital, I spend most of my time staying inside my home, doing nothing... at that time, I could not use a cell phone, could not use my computer, just sitting on my bed doing nothing. Then, a switching my doctor changed everything: The opthalmologist knew there is a rehabilitation facility in Fukuoka city and he arranged for an appointment with them. After all, I started receiving blindness rehabilitation training at one of a very few facilities in Fukuoka city. If my doctor did not tell me about it, I might end up staying inside for the rest of my life! I have been a big fan of straight, candybar cell phones. When I lost my vision, I panicked! - How I can get in touch with friends and families!? There are three major mobile service careers in Japan, and all three offers a talking phone of sorts. NTT docomo - It sells the series of phones that are called RAKURAKU phone by Fujitsu. Though the phone is originally designed for eldery people who look for a easy-to-use phone with large buttons and displays. In addition to these, it also includes screen reader functions that reads menus and things on screen, and the contents in compact internet browser as well! I can make and receive calls, check and reply email, looking for buses and trains tametable with web browser, making a phone read out for me. In addition to that, my RAKURAKU Phone Premium has Felica chip built into the phone, so it works like a nfc enabled phone! I can purchase sandwiches and drinks by waving my phone at a cash register, I can get on buses by touching my phone to a chip reader, I can go through train gates by touching it, and I can go to the airport and get on a plane with it! So, I already registered with ANA (All Nippon Airways) as I am visually impaired and need help. If I want to fly with ANA, I go to the airport by waving my phone on a bus and subway stations. On transportation, I access to the airline website, purchase a ticket on the phone. No worry about downloading a bar code / QR code because the e-ticket is in a chip. Then I wave my phone over a chip reader at security check, and the airport staff come and help me take to the correct gate, and wave my phone at the gate for boarding. What a life! The other mobile service career, au, has a Kyocera phone. Though it does the basic things, I was not happy with the overall design in a way that buttons are flat and hard to distinguish which key is the numbers or function keys, and speech is not as precise. For visually impaired, it could be an option, but for the blind, NTT docomo phones have advantages. On the other hands, SoftBank does not have any phones that has screen reader built-into the phone, but... wait! SoftBank sells iPhone! Starting with iPhone 3GS, iPhone comes with a built-in screen reader called VoiceOver! Though it takes time and concentration on finding out where to tap, I could use it... only if the language is set to English. Yes, iPhone VoiceOver comes with Japanese Voice, but the sound is not impressive at all, but what is worse, the voice does not read when entering Japanese characters, making it almost impossible to enter Japanese words correctly! As I was loosing my eyesight, I tried to see the screen by using zoom fuction built into MacOSX, but since I completely lost my sight, I started using its built-in screen reader, VoiceOver. Since Apple is an American company, VoiceOver in English works great! It:s compatible with most Apple apps like Safari browser, Mail, iTunes, iPhoto and few other apps. I couldn:t imagine I still could udo most tasks on my Mac! The other notable app that is compatible with VoiceOver is Skype, so I can even voice-chat with friends! But alas, VoiceOver does not work well with some Apple genuine apps like Address Book and Aperture... Moreover, using facetime is rather frustrating. Anyway, I am quite happy that I am a happy camper with VoiceOver, but I just wish it becomes bilingual... it automatically detects language and change speech with different language set flawlessly. A blind man can use computers! - With a help of screen reader software that reads things shown on a computer screen! When I go blind, I was givving up a hope of using a computer like before losing my sight, but I can do lots of things with a computer and a screen reader installed... I can send and receive email, check news on the web, read books, search for information, and restart blogging! As a Japanese who needs a computer that reads both Japanese and English, I chose a screen reader software called 'PC Talker' over other software like JAWS... because I am using MacBook Pro running Windows 7! What I like about PC-Talker is that it comes with both high quality Japanese and English voices for smooth and fluent speech. Moreover, it is the most well-known screen reader software in Japan, along with the other software developped exclusively for the blind. To name a few, there is a web browser called Net Reader (Apparantly it:s just an IE shell), My Mail the email client, My NEWS the RSS reader, My Read the OCR software and so on. I heard it is regularly enhanced and improved, and for the best, it is cheaper than other screen readers besides the free MacOSX VoiceOver! I looked into JAWS first, but I gave up on it for the sake of high price, lack of support in Japan and Japanese, and what:s the worst, I can:t use it on my mac unless I connect an external full keyboard! JAWS use Insert key for a command, which the Mac notebook keyboard doesn:t have. Moreover using JAWS in Japanese require 無変換 and 再変換 keys to enter commands but my MacBook Pro comes with US English Keyboard, so I excluded JAWS for my choice of screen reader, though it is one of the most well-known screen reader to the world. It took nearly 6 months to get my screen reader, but once I got it, I became a happy camper! For last several years, I keep posting photos on a photo sharing website, flickr. Once upon a time I wasin a hospital receiving eye and heart surgeries, I took a photo of me in a hospital bed thinking I may lose my eyesight. As of September 2011, I have been sightless for two years and two months, lost the sense of light for a year and two months. I have an inherit heart disease called Idiopathic Dilated Cardiomyopathy (IDC). After 10 months in hospital I walked away from there with completely loss of eyesight caused by glaucoma. No sense of light at all. If I was treated as I had a stroke for the first visit at the hospital and I received an IV, my eyes would have been saved, but it's too late. Instead of complaining the past things, I would rather think ahead and figure out what I can do.